Dream. Dress. Play. 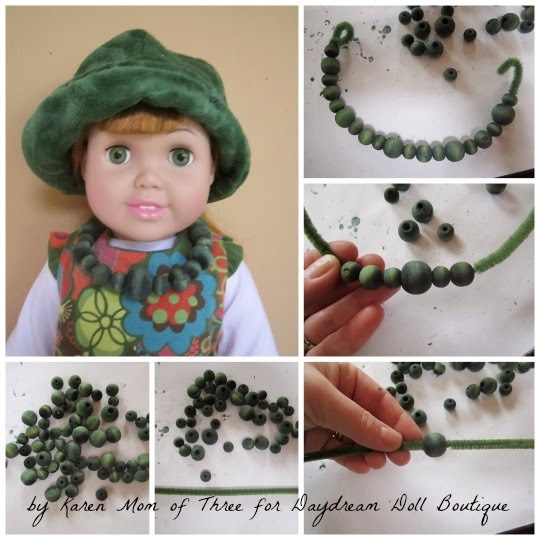 : Make It Monday~ Make Your Dolls A Kelly Green Rit Dyed Wooden Bead Necklace For St. Patrick's Day! 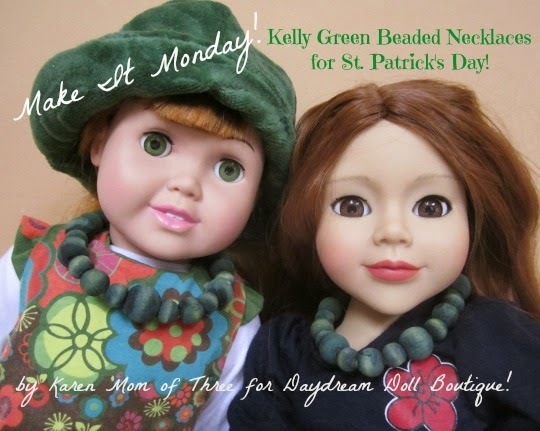 Make It Monday~ Make Your Dolls A Kelly Green Rit Dyed Wooden Bead Necklace For St. Patrick's Day! Happy Make It Monday! 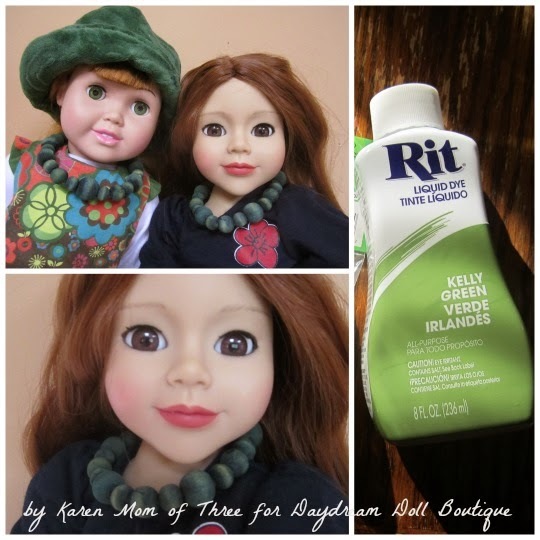 I have wanted to share this craft with you for quite some time and today using two of my Red Headed Dolls to model the Rit Dyed Wood bead necklaces I created for them for St. Patrick's day. 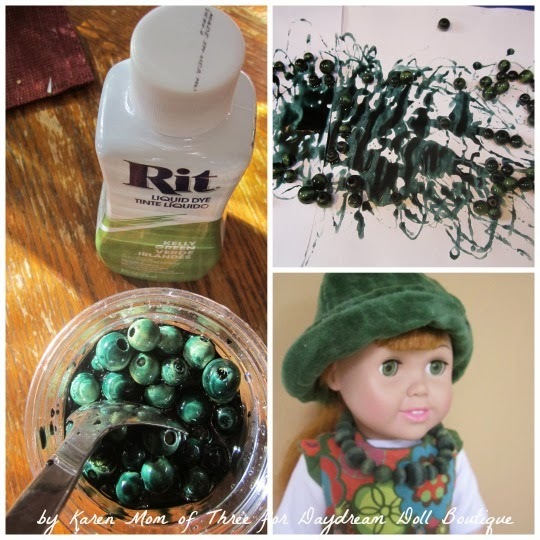 This is an easy and fun craft to do for a sleep over or St. Patrick's themed craft party. Step one- Assemble all your craft supplies. Open and pour your Rit Dye into the cup. Step 2- Add your unfinished wooden beads, stir with a metal spoon. Step 3- Cover with plastic wrap and set aside over night. The longer you leave your beads in the dye the darker they become, you can stir them ever few hours to make sure your beads are evenly coated. Step 5- Line a cookie sheet with newspaper and put your beads on the paper, roll them around as they dry. Step 6- Once dry, thread your beads onto your pipe cleaner. Alternate the sizes as you go or keep them all the same it is up to you! Step 7- On one end of your pipe cleaner bend the edge and twist to create a loop as shown in the top photo above. Step 8- On the opposite end make a "hook" shape and place the necklace on your doll, placing the hook through the loop to secure it. I hope you have enjoyed today's post! 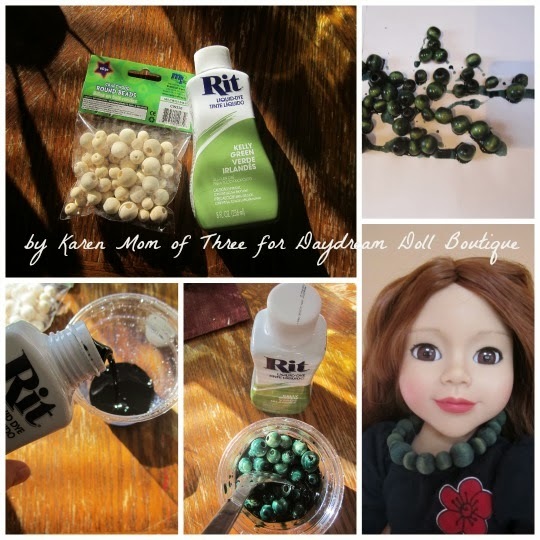 Working with Rit Dye is so easy and fun, it is one of my favorite craft items to work with. No mater if it is wood, Fabric, Paper Crafts and more are enhanced by Rit Dye!